The electric, power-assisted bike (e-bike) movement has hit my home streets of Seattle hard the past year. I bike to work 3x/week and while I used to see an occasional e-bike each month or week, now I see them daily. Their utility for bike commuting can’t be denied. Traffic in Seattle and its outlying areas is horrendous, so e-bikes allow the most casual cyclist the freedom to travel the roads with minimal effort, especially up numerous hills while carrying what they need for the day, or even to the grocery store or with kids in tow. Using quiet side streets or bike trails allows them to navigate the city without being stuck in traffic, often in the same amount of time - or less - as driving a car. E-bikes are a growing movement for inner-city transportation….and as I learned also for holiday touring. This fall has been my 4th visit to Hotel Il Perlo Panorama, each time tackling the local Lake Como climbs featured in races such as the Giro d’Italia and Giro di Lombardia, but more importantly savoring the views and unique beauty where mountains plunge into the blue waters and climbs take you past quiet Italian villages. Riding in the area typically requires lightweight carbon fiber road bikes and a certain amount of grit and stubbornness (not to mention restraint with gelato consumption!). Even simply returning to the hotel after a lakeside jaunt requires a 1km climb with a section of 14% road grade. The most fit cyclists climb back to the hotel quite gassed, albeit with a great sense of accomplishment. But it’s not enough to reserve the beauty and history of this area to fit cyclists who have put in months of training to adapt to these climbs. That would be like reserving entry at the local gelato shops for Michelan-star chefs. Fortunately, Il Perlo provides e-bike rental so you can explore the area at your leisure and eat your gelato too. 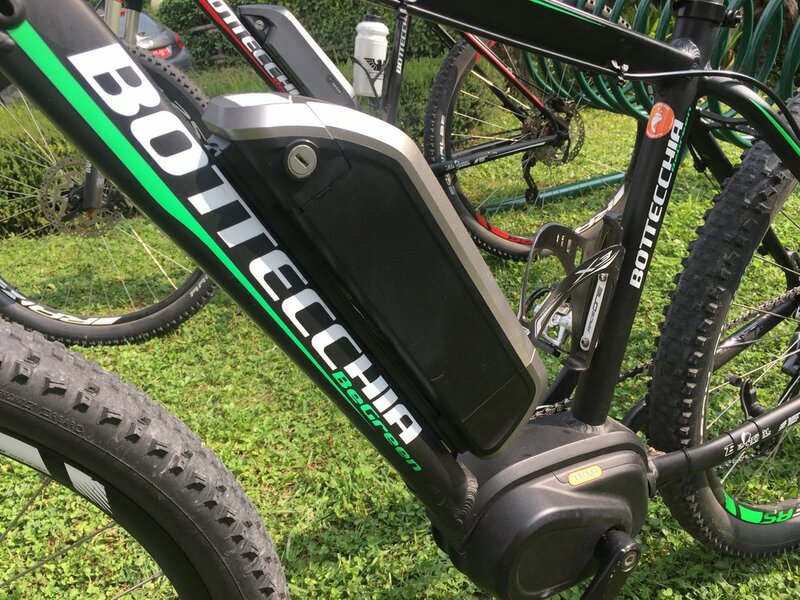 This week I was part of a small group that rented Bottecchia mountain e-bikes at Il Perlo. 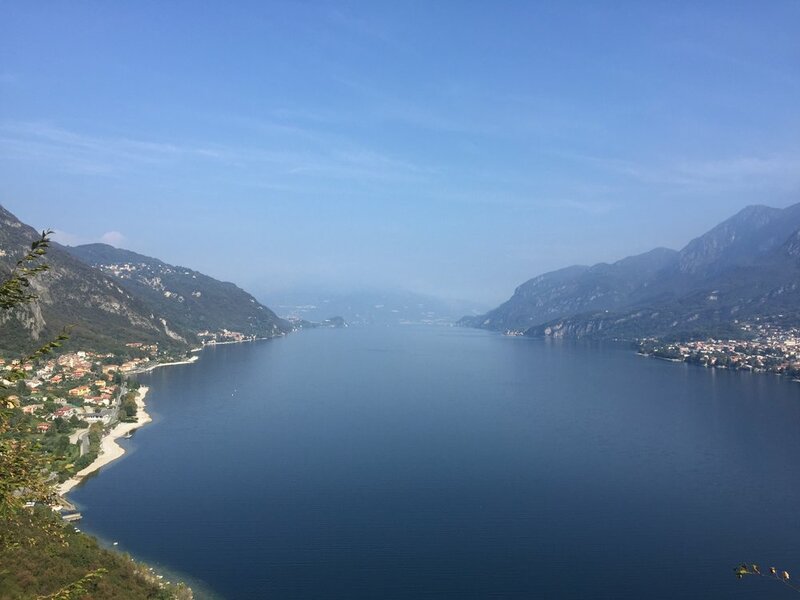 A recently retired couple from Connecticut had just spent a few weeks hiking around Cinque Terra and was keen to try a scenic guided ride around Lake Como. Road bikes requiring special shoes and pedals, not to mention stamina, were not the answer, but easy-to-use e-bikes were. The bikes are not like a scooter, you still pedal the e-bike to move forward, but when the bike reads a certain amount of resistance the electronic assist kicks in with delight. Our route would be a popular introduction to the area: a 32 km, 700 meter (20 mile, 2300 ft) loop through the eastern part of the Triangolo Lariano, the mountainous triangular area between the two southern arms of Lake Como. This popular route has 2 long climbs interspersed with small villages and scenic valleys as it first goes south from Bellagio then back north through the Triangolo with a highlighted stop at the Madonna del Ghisallo chapel. The e-bikes were sized for each member of our group, who only needed comfortable clothes and street shoes for this journey. It took less than a minute to explain the buttons that control the assisted power and gearing. Although the bikes are quite heavy (20kg, 45 lbs!) with their electronic equipment, sturdy aluminum frame and wheels, a quick turn around the parking lot was enough to feel the WHOOSH of power and we were off! Even descending the steep 1km from Il Perlo, the disc brakes gave instant confidence in their stopping power. Along the lakeside road, you could enjoy the scenery and not worry about bumps in the road because the fat mountain bike tires absorbed any impact and made the journey smooth and comfortable. The road between Bellagio and Onno has a few small “roller” hills that were great for getting used to the electric assist and gearing. Even on the flat sections there was little effort required and we cruised along enjoying the morning sun reflecting on the lake. The maximum speed of these bikes is 25kph (15mph), but we never needed much more speed…..otherwise we’d miss everything! When we arrived in Onno, a right turn brought us to the first 5km (3 mile) climb and the real test of the e-bikes began. A quick push of the + button to a range of 1 (little assist) to 5 (full assist) carried you forward with no effort. When we felt the bike take over and accelerate uphill, everyone let out a huge smile and laughter, it was like being a kid on a roller coaster, but in complete control. Looking at our guide who was pedaling a standard road bike and putting the required effort into the climb, I wondered why I would ever need to pedal major watts again…the e-bike does all the work! At the half-way point of the climb we stopped at an overlook of the lake. After only 30 minutes on the bike, our visitor from Connecticut was beaming with happiness at how comfortable the bike was, how it carried her to this beautiful spot she would never have seen. In all this joy she told us that last year she had surgery fusing 3 vertebrae in her back with titanium rods, and that this is the first ride she’s been able to do since the surgery. The e-bike had delivered her this gift and the ride had just begun. At the end of the first climb is a stop at a popular cyclist water fountain in Valbrona. Then we were off through the valley, climbing up through Asso, then turning north up a gentle grade to the medieval village of Barni, and finally a short steep climb to the highest point of our journey at the Madonna del Ghisallo chapel. As a lifelong cyclist the Madonna del Ghisallo chapel has always held a special place in my heart, but for non-cyclists I was thrilled to see how much they were touched by this monument to Italian religion and cycling history. It doesn’t take a lifetime of cycling to appreciate its reverence when first seeing its ancient bell tower, curved arches, the tiled Madonna and child mosaic, the decades-old memories of departed cyclists, and cycling artifacts lining the chapel walls. Riding the e-bikes allowed our guests to visit the chapel just as travelers have for centuries, under their own power, and to feel welcomed by its protection as they never could have by car, if at all. The ride from the Ghisallo back to Il Perlo is about 10 km along the eastern ridge of the Triangolo Lariano, with steep switchbacks immediately after the Ghisallo and again above the hotel. The disc brakes provided full confidence riding down these hairpins, whether at speed or at a more cautious pace, and the fat tires provided plenty of surface area for gripping the pavement. When our small group arrived back at Il Perlo, there was nothing but beaming smiles and elation at such a wonderful ride. 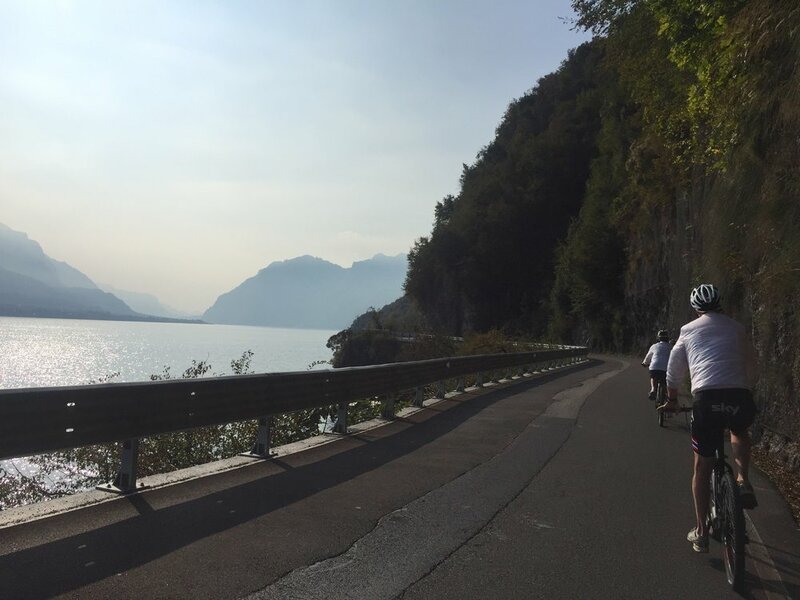 In just 2 hours our guests saw some of the most well known Lake Como sights and roads, opening a world that they could only have seen by car, but without the intimacy provided by a leisurely cycle. 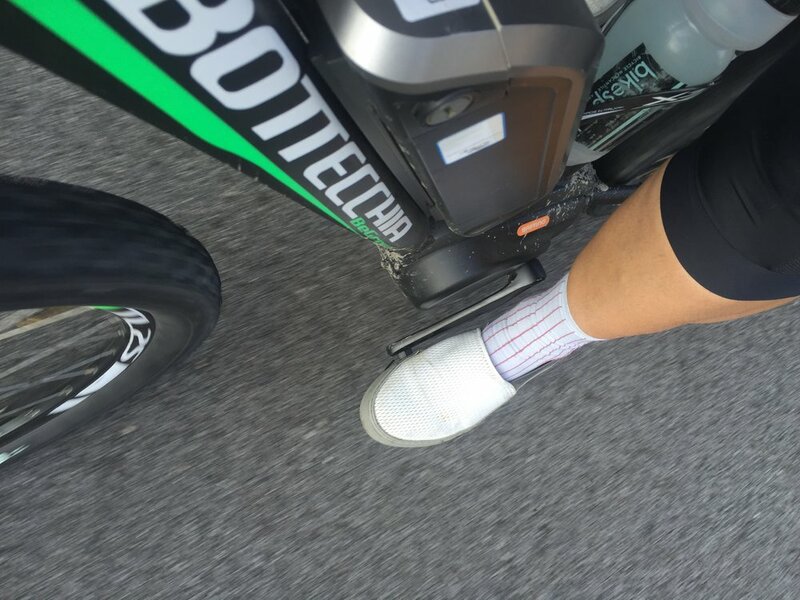 With the e-bikes they not only got low-impact exercise with a lot of beautiful sunshine and fresh air, but they also got to admire the landscape, seeing ancient villas tucked in the hillsides, WWII memorials in small villages, and a more intimate immersion into the region’s culture.